Some call it "a pressure-induced involuntary muscle movement." Others call it "a loss of control of your shot." In most circles, it's called the yips. As you may be aware or you may have experienced, the yips are the loss of fine motor skills in athletes. The condition seems to occur suddenly and without an apparent trigger, cause or adequate explanation. It usually appears in mature athletes with years of experience. It has been poorly understood and we have, to this point, no known treatment or therapy. Though rare, athletes affected by the yips sometimes recover their ability, which may require an overall or partial change in technique. However, many at the highest level of their sport are forced to abandon their livelihood. Some are still at or near the peak of their careers. The yips manifest themselves as muscle twitches, jumps, shakes, jitters, flinches, staggers, and jerks. The condition occurs most often in sports which athletes are required to perform a single precise and well-timed action such as in baseball, golf, tennis, bowling, darts, and cricket. There are many suggestions that it is a muscular problem or neurological issue. However, technical solutions that focus on major changes in technique or motion are largely ineffective. On a less severe but more frequent note, many athletes go through slumps, some that last longer than others. For example, in basketball, jump shooters and free-throw shooters often go through periods of time where their shooting percentages decrease significantly or their shooting becomes streaky, or both. In either case, their ability to successfully make their shots has been altered. Likewise, tennis players can lose their ability to serve in a flash. Golfers lose their ability to putt, or drive the ball off a tee. Whether you are experience the yips, or you are in a slump, it is clear to me that even a minor shooting, serving, putting, or pitching problem, has its source and/or is quickly exacerbated and maintained by an athlete's internal dialogue; their self-talk. In my last blogpost, I talked about strengthening your mental core. Your self-talk or internal dialogue is an important part of your mental core. If you take a look at slumps in putting and teeing-off in golf, shooting in basketball, or serving in tennis, self-talk or internal dialogue is crucial in understanding the beginning, middle and end of a slump, or more problematically, the development of the yips. The most successful athletes are often the best mentally conditioned. Their self-talk is either positive or non-existent. As I and many others involved in sports and performance psychology know, self-talk affects performance. During competition or practice sessions, the ability of an athlete to eliminate harsh or negative self-talk can improve performance dramatically. Unfortunately, many athletes do not or cannot quiet their inner dialogue, particularly their inner critic. Excessive self-talk, whether positive or negative, is like having fans (or one particular fan) in the stadium, the arena, or in the gallery yelling at you at various intervals right before and during your shot or serve. A fan who wants to disrupt you might yell: "Miss it!" A supportive fan might yell: "You can do this!" Encountered at the wrong time (i.e., at the moment you are executing your task) either can disrupt. "I don't think I can make this." "If I miss this, my coach is gonna bench me." "This is a lot of pressure." "It's all on me." "What if I miss?" "I should have practiced this shot more." "Come on, you've got this!" "Would you just relax?!" Now, your self-talk is not necessarily intended or designed to disrupt. Often, as with a supportive fan, it is usually intended to calm you or focus you on the task at hand. It might be meant to provide encouragement or motivation. Unfortunately, like an enthusiastic parent yelling instructions (or encouragement) to you from the stands, the net effect is that it disrupts your concentration and focus. Over time, it erodes your self-confidence because the message is that you need last-second help, encouragement and instruction. It's not a good message, really. More importantly, it interferes with deep muscle learning and disrupts muscle memory. Self-talk can undermine all the hard work that you have put in. With these types of messages, your brain is interrupting your shot, and your muscles are saying, "Wait, what?" Because of this sudden emergency interruption, your muscles are saying "I must be about to do something wrong, otherwise, why would my brain be talking to me right now?" So, while you are busy talking to yourself, your muscles are reacting to your inner message by either trying to adjust, overcontrol, restrict, or over-correct your shot. In most circumstances, you will ever so slightly slow down, stop or inhibit your motion (shorting the shot) or over-correct (by shooting long). 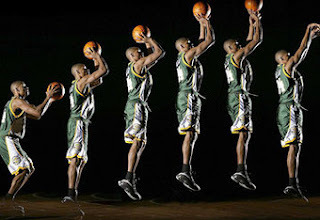 Once you begin to overcorrect during the shot, your regular motion is affected. Sure, you might still make the shot, but the probability has been changed, often dramatically. With enough disruptive self-talk occurring on a regular basis in practice and during competition, an athlete's ability to effectively develop and firmly establish smooth fine motor movements is compromised. Self-talk affects the encoding of muscle memory through a series of micro-disruptions. With a sufficient stream of micro-disruptions, small disruptions of fine motor movements occur, resulting in an inefficient, and often erratic set of fine motor movements. As your motor movements are affected, so is your comfort with your shot. Any ongoing discomfort begins to erode your self-confidence. Eventually, your self-talk produces self-doubt which causes you to not only question yourself but to question the fine motor movements themselves. That's the way you forget how to shoot, putt, throw, kick, serve. It's your inner critic thats attacking your muscle memory. This constant internal criticism can erode what you have spend hours trying to perfect. It's a type of waterboarding. Death by a thousand cuts. The more that I work with athletes and look closely at their self-talk, it appears that self-talk is prevalent enough to cause physiological disruption in fine motor movements. At first, it affects individual shots, causing enough disruption in the athlete to miss any particular shot. If the athlete's self-talk is disruptive enough and frequent enough, it causes shooting slumps; and, if an athlete's self-talk is chronic enough will create a more severe disorder, the yips. My experience is that many, if not all, athletes have, at least, a very mild case of the yips. With enough practice, most athletes can overcome harsh, negative, and disruptive self-talk. However, when self-talk is at it's most disruptive, it can affect even the most rehearsed shot. In fact, I contend that any missed shot has, at some level, been disrupted by self-talk. A missed shot becomes a slump through increasingly negative self-talk, followed by increased self-consciousness about subsequent misses. The yips are simply the extreme consequences of extreme self-consciousness. At its worst and most frequent, negative self-talk could "metastasize" into the yips. So, what can you do about your early stage yips? Be aware that your self-talk is disrupting your deep muscle learning and memory. Don't let the yips get to you. Want to make your shot consistently, or serve with confidence? Want to avoid slumps? Quiet your self-talk. Shut your inner critic down. Your muscle memory will thank you for it.